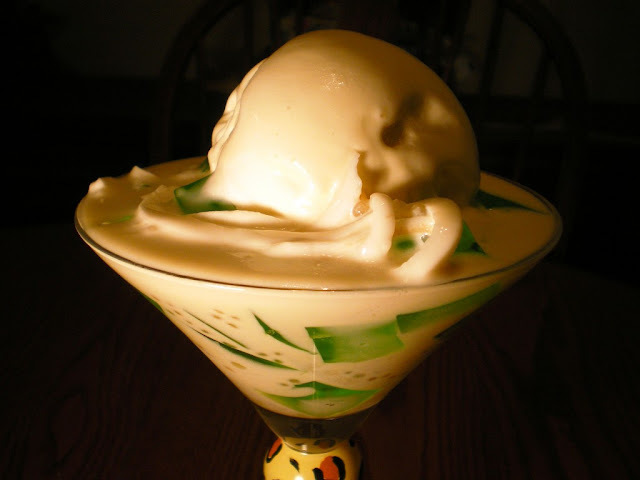 Buko Pandan is a popular Filipino dessert. A variation of the classic creamy dessert fruit salad, with a refreshing and mouth watering taste of pandan.And since summer is already here, why not make one of our best Filipino desserts, the Buko Pandan. The coconut is not just a giant nut, but also a meaty one! What’s best to do with the fruit of the tree of life? Make a mouthwatering dessert out of it! This yummy dessert is very easy to do and can be made with just more or less five ingredients including “buko” or young coconut and pandan leaves added as flavoring to the gelatin or “gulaman”. The fragrant smell of pandan is soothing after a filling meal. 1. Boil water together with 8 pandan leaves that are individually twisted to break the fibers and expose the juice. Simmer for 20 minutes. 2. Before adding 2 bars of gulaman, make sure you remove the pandan leaves and check if the remaining water is equal to 8 cups – 1 bar of gulaman is good for 4 cups of liquid. If it is not 8 cups, less will mean hard gulaman and more than 8 cups will result in mushy soft gulaman. 3. Ensuring gulaman is well-dissolved stir well. 4. Add sugar while mixing. Do this for 5 minutes. 5. Pour through a strainer into cooling trays. Wait till it cools and hardens, then put in fridge. 6. Meanwhile, mix the grated buko with the 3 cans of cream and 1 can of condensed milk. 7. Add Kaong or Nata de Coco if you prefer. 8. Get gulaman from ref and cut into 1 cm cubes. Mix with buko mixture. 9. For added flavor, serve Vanilla Ice Cream on top.